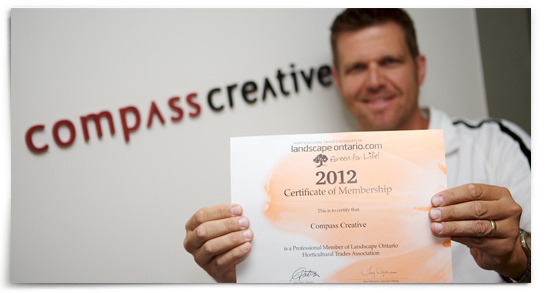 BURLINGTON (July 16, 2012) Compass Creative Studio Inc. is excited to announce their new memberships to both Landscape Ontario and the Ontario Home Builders Association. From its earliest days, Compass Creative has had a close connection with professional tradespeople, providing brand identity and marketing services to many local landscapers, growers and builders. Over the years as that client base expanded, their expertise on marketing within these industries has deepened. Their mission today is to use their refined understanding of the issues and challenges within these industries to provide the most relevant, strategic marketing services possible. With their new associations – Ontario Home Builders Association and Landscape Ontario – Compass looks forward to working with the builders, landscaping organizations and other trade professionals to promote the great work they do. To help each firm discover their unique story and convey it in a more meaningful and compelling way.